Two alternate jurors in the trial of white Chicago police officer Jason Van Dyke say they would have found him guilty in the 2014 shooting of black teenager Laquan McDonald. The jury has stopped deliberating for the day in the trial of white Chicago police officer Jason Van Dyke, who is charged with murder in the 2014 shooting of black teenager Laquan McDonald. After jurors had deliberated for nearly five hours Thursday, Judge Vincent Gaughan announced that he would be stopping them and sequestering them for the night. The jury will resume deliberations Friday morning. The judge said the jury had sent him a note asking for a transcript of officer Joseph Walsh’s testimony. Walsh was Van Dyke’s partner the night of the shooting and testified that he saw McDonald, who had a knife, raise his hand in a threatening manner. Dashcam video of the shooting does not show that. The Chicago Police Department is bracing for a verdict in the murder trial of a Chicago police officer with plans to add put thousands of extra police officers on the street. When the video of Officer Jason Van Dyke shooting black teenager Laquan McDonald was released three years ago it prompted widespread protests and sometimes violent clashes between demonstrators and police. Police say they’re taking steps to keep the peace. Spokesman Anthony Guglielmi says that not only will there be an extra 4,000 officers on the street, but the department is putting officers on 12-hour shifts and canceled days off. Jurors began deliberating on Thursday afternoon. Protesters are already putting out notices of planned demonstrations to be held after the verdict is announced. 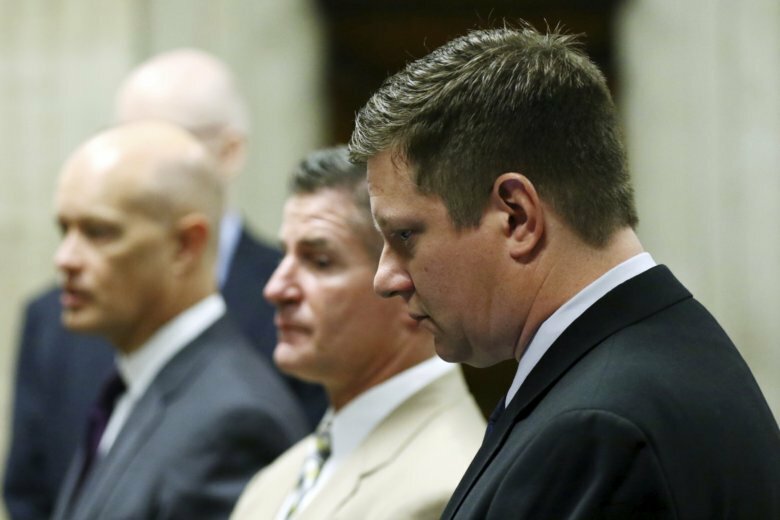 Jurors are now deliberating in the case of a white Chicago police officer charged with murder in the 2014 shooting of black teenager Laquan McDonald. Officer Jason Van Dyke is charged with first-degree murder, aggravated battery and official misconduct in the 2014 shooting of McDonald. But the judge told jurors on Thursday that they can consider the lesser charge of second-degree murder during their deliberations. Jurors can find him guilty of second-degree murder if they find that Van Dyke believed that he was justified in using deadly force but that that belief was unreasonable. Prosecutors contend the shooting was not justified. Van Dyke’s attorneys argue that Van Dyke was in fear for his life and acted properly in shooting the 17-year-old, who was armed with a knife. Key in the trial is video that shows Van Dyke opening fire as McDonald walks at an angle away from him. Attorneys sparred during closing arguments over what the video actually proves. A defense attorney for a white Chicago police officer charged with murder says video of the 2014 shooting of black teenager Laquan McDonald is “essentially meaningless” based on other testimony presented at trial. Defense attorney Dan Herbert told the jury during closing arguments Thursday that the video of Jason Van Dyke shooting McDonald 16 times as the 17-year-old holds a knife in his right hand doesn’t tell the whole story. Herbert specifically pointed to testimony from Van Dyke’s partner, Joseph Walsh, who said he saw McDonald raise the knife, even though the video doesn’t show that. A prosecutor said Van Dyke made up his account that McDonald raised the knife and tried to get up off the ground after being shot. Walsh is one of three officers charged with conspiring to cover up and lie about the circumstances of the shooting to protect Van Dyke. A prosecutor has told jurors during closing arguments at the trial of a white Chicago police officer charged with first-degree murder that they’ll have the option of convicting the officer of the lesser charge of second-degree murder. Jody Gleason told jurors Thursday the judge will instruct them that they first have to conclude Officer Jason Van Dyke did commit murder when he shot black teenager Laquan McDonald 16 times in 2014 as McDonald walked away carrying a knife. They would then decide whether first-degree murder or second-degree is more appropriate. She said if Van Dyke knew killing McDonald wasn’t justified and killed him anyway, that would be first-degree murder. If jurors find Van Dyke truly believed the shooting was justified but that that belief was unreasonable, second-degree murder would apply. First-degree murder carries a maximum sentence of life. The maximum penalty for second-degree murder is no more than 15 or 20 years. A defense attorney for a white Chicago police officer charged with murder in the 2014 soothing of black teenager Laquan McDonald says jurors must see the case from the officer’s perspective. He told the jury the case is a tragedy but not a murder. He says it’s a tragedy that could have been prevented “with one simple step.” He then dramatically took out the knife McDonald used and dropped it to the floor. He also called it “preposterous” to think Van Dyke could have waited 30 seconds for someone to arrive with a Taser. Herbert’s comments came after prosecutor Jody Gleason told jurors that an officer with a Taser was less than 30 seconds away when Van Dyke shot McDonald 16 times. She says Van Dyke exaggerated the threat McDonald posed. A prosecutor in the murder trial of a white Chicago police officer who shot Laquan McDonald in 2014 says the officer has exaggerated the threat the black teenager posed. During closing arguments on Thursday, prosecutor Jody Gleason pointed to video of Officer Jason Van Dyke shooting McDonald 16 times as the teenager held a knife in his right hand. She noted that Van Dyke told detectives that McDonald raised the knife, that Van Dyke backpedaled, and that McDonald tried to get up off the ground after being shot. Van Dyke’s attorneys say he was afraid for his life and acted according to his training. They will present closing arguments later Thursday. A prosecutor in the murder trial of a white Chicago police officer who shot Laquan McDonald says the black teenager wasn’t doing anything that made it necessary to kill him. Van Dyke arrived after McDonald had used a small knife to puncture a tire of a squad car. Officers were waiting for someone to come with a Taser to use on the 17-year-old. Gleason says an officer with a Taser was 25 seconds away when Van Dyke shot McDonald 16 times. Attorneys in the murder trial of a white Chicago police officer who shot black teenager Laquan McDonald 16 times are poised to make their final pitch to the jury. Testimony wrapped up Wednesday in the trial of Officer Jason Van Dyke. The judge then announced that closing arguments would begin on Thursday morning. Van Dyke is charged with first-degree murder, aggravated battery and official misconduct in the 2014 shooting of McDonald. Prosecutors contend the shooting was not justified. Van Dyke’s attorneys argue that Van Dyke was in fear for his life and acted properly in shooting the teenager, who was armed with a knife. Key in the trial is video that shows Van Dyke opening fire as McDonald walks at an angle away from him.